(April 16, 2018) -- To advance UTSA’s vision as San Antonio’s university of the future, President Taylor Eighmy today announced the formation of the Division of Student Success and the Division of Strategic Enrollment. The new divisions will be led respectively by Rhonda Gonzales, interim vice president for student success, and Lisa Blazer, interim vice president for strategic enrollment. The Division of Student Success will take a student-centric approach to dramatically improving UTSA’s retention and graduation rates, focusing on K-12 continuum through recruitment, enrollment, academic progress, career development and placement. It will include Advising, the Graduation Help Desk, the First Generation and Transfer Student Center, the LEAD and SOAR Summer Academies, the First Year Experience, the Tomás Rivera Center and the Math Matters Student Success Center. 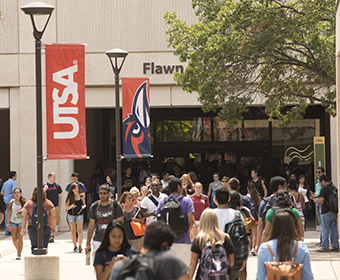 The Division of Strategic Enrollment will implement UTSA’s long-term student enrollment strategy and will include Undergraduate Admissions, Undergraduate International Admissions, Orientation and Family Programs, Enrollment Information Systems, Enrollment Services Marketing & Communications, the Testing Center, the Financial Aid & Scholarship Office, the One Stop Enrollment Center, the Registrar, the University Career Center, the Institute for P-20 Initiatives, the Prefreshman Engineering Program and TRiO – Student Support Services. In October, President Eighmy unveiled his vision to make UTSA San Antonio’s university of the future, an institution that produces graduates who tackle the grand challenges of today’s world. Task forces focusing on Student Success, Strategic Enrollment, Finance and Budget Modeling, Strategic Communications and the Downtown Campus are underway to advance progress toward that vision. Learn more about the Vision for UTSA.